Hi everyone! Welcome to my stop of the Heffy Doodle blog hop! I hope you’ve seen lots of fun projects so far today. And there are plenty more still to come! If you’ve started here, head back to the Heffy Doodle blog and start from the beginning. 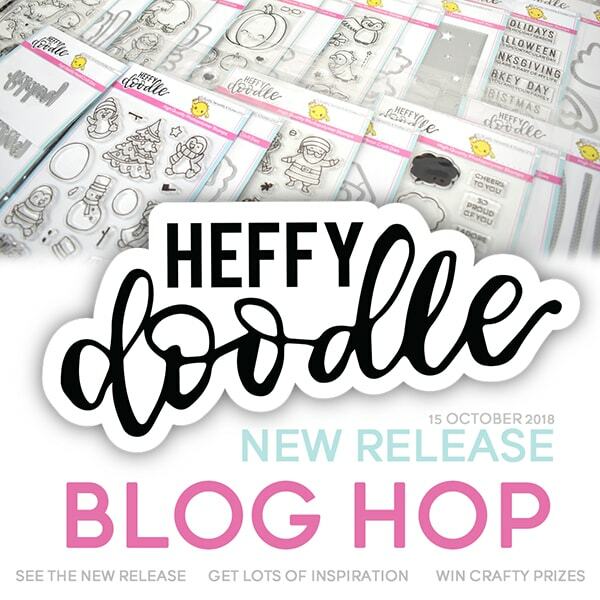 Leave comments on the blog hop posts to enter yourself for a chance to win a £50 gift certificate to the Heffy Doodle shop. Here’s a list of the stops today in case you need to make sure you haven’t missed anyone! Alright! 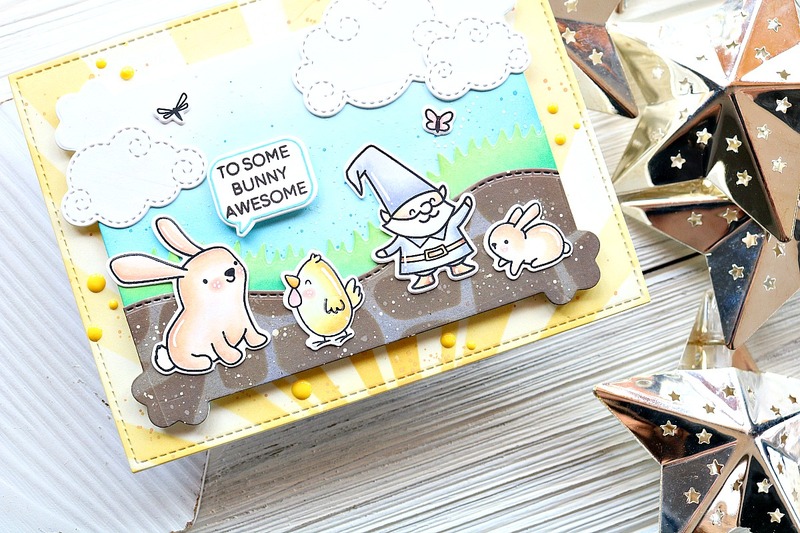 Let’s get to my card for today 🙂 I’m using some new products today alongside some old products to create a really cute scene and awesome shaker card. Here’s a look at the project. Yup! That’s a volcano shaker card! My sister gave me the idea for this, and I’m happy to say it turned out just like we imagined. To start I stamped out some of the dinosaurs from the Dino Time stamp set along with the volcano from Geology Rocks. Everything was colored in with my Copic markers and die cut with the coordinating dies. I knew my colors were going to pinks and reds, so I tried to keep the dinos pretty neutral with only a hint of pink for some color. Once that was done I started to make the scene for these cuties to be in. I started by taking an A2 size piece of white cardstock and die cutting the third largest rectangle from the Imperial Stitched Rectangle dies from it. Next, I took a heart die from my stash and die cut a V shape from the top of the inner rectangle I die cut. This was going to be for my shaker. On the outer frame I ink blended some Candied Apple Distress Oxide ink and spritzed it with water for the speckled look. Then I used the First Snow Stencil to create some hills on the inner rectangle with some Walnut Stain Distress Oxide ink. Once all that was done I started assembling my shaker. I was a little difficult to get the sequins right where I needed them, since my shaker window was so small and oddly shaped, but even with the fussing I had to do with it I still think it was worth it in the end. I used two layers of foam tape to add dimension and give enough space for the sequins I used to have room to move around. When that was all put together I could add my dinosaurs and volcano. To finish off the card I heat embossed my sentiment on some black card stock with white embossing powder. I used the Strips of Ease die to cut out the sentiment and cut a banner in one end. 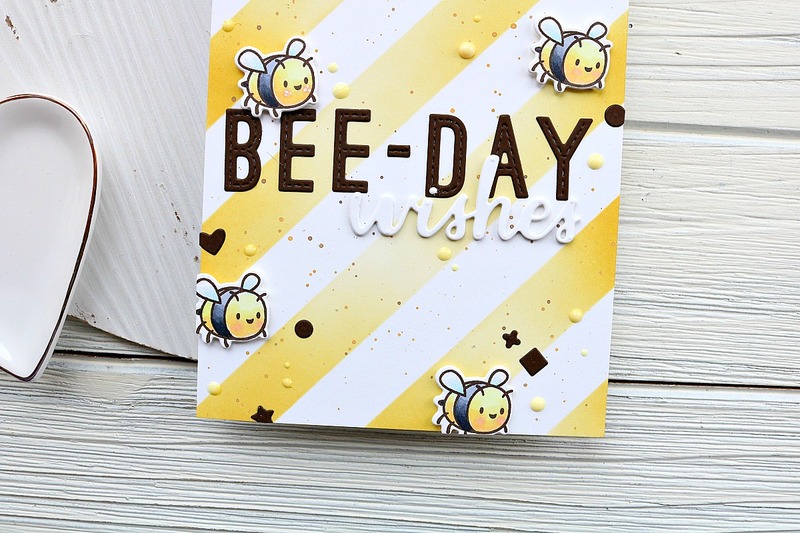 I also added some white gel pen accents to the images, and then my card was complete! I hope you enjoyed the card for today, and are having fun on the hop! Don’t forget to leave a comment for a chance to win a gift card to the HD shop! Winners will be announced on the Heffy Doodle blog on October 24th. And if you’re doing some shopping be sure to remember the promo going on right now to get the cute freebie Dinky Dinos. Spend £30 to get dinky dino stamps, spend £45 to get stamps and dies. Thanks so much for stopping by and I’ll see you again soon with another card! 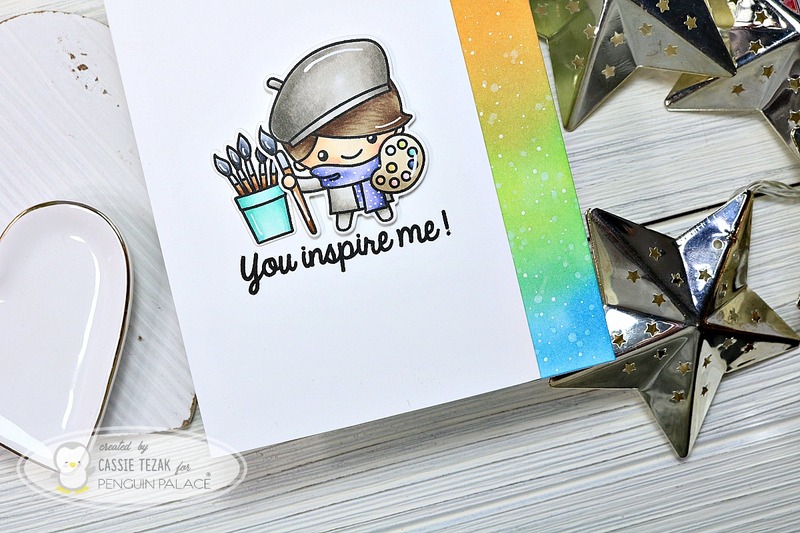 Previous Your Next Stamp Release Blog Hop! I love this! You’re so clever! Using the bling for the lava is perfect! You are a genius. This is THE best shaker I have ever seen. Just perfect!! Love the shaker element. So fun!! What a great and unique idea for a shaker card! Love this, well done, and thanks for the inspiration! What a cool idea of shaker volcano :() It would be great to have a volcano emitting pink sequins. ! I love the shaker card so much, and the background is perfect. I’m so in love with this super cute card. Such a creative shaker design! Very pretty. These dinosaurs are so cute! Love!! What a fun card with a shaker volcano! Super fun and creative card! I absolutely love the design and color combo. I think this is about the cutest thing ever. You are so talented! Clever idea. The volcano rocks. Very creative and cute card! I love that you made the shooting lava from the Volcano into the shaker part of the card! Really cool looking! And your coloring is gorgeous too! Cute card!! Such a lovely shade of pink. Love the combo of old and new products to create this fab shaker. The palette is perfect for the theme. Thanks for sharing this inspiration with these fun products. What a fantastic card! The tulle on the outside of the shaker helps make it feel like smoke coming out with the lava, which just adds to the whole fun vibe of the shaker card. Thanks for sharing such a great idea with us!